I have to admit to being a little cranky the last couple of days. Some of it has to do with days getting shorter and darker earlier (I love the long days of summer! ), some has to do with the never-ending cleaning and organizational projects I seem to have on my plate (my clean house on Saturday no longer looks that way), but the biggest thing that is yanking my chain is the advent of Christmas. I really despise/loathe/dislike all the Christmas paraphernalia, decoration, merchandise, music, and yes, even Starbucks holiday drinks (c'mon...has the pumpkin latte even been on the menu for that long?). Not only does it make me feel like the stores are shoving Christmas in my face and down my throat (yes, I know retailers are trying to make money and stay in business), and not only do I feel like they are cheapening and over-commercializing a really wonderful holiday, but I feel like ultimately, they are minimizing and almost completely leaping over an equally wonderful and important holiday.....Thanksgiving. 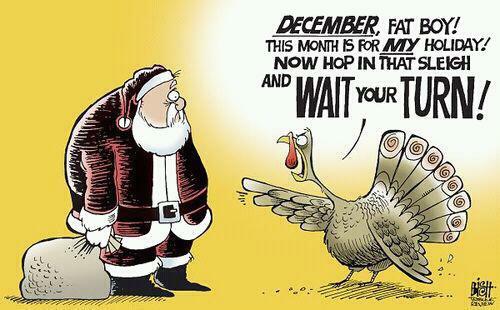 I'm not sure when Thanksgiving became an adjunct holiday to Halloween or merely a stepping stone into the frenzy of Black Friday and Christmas shopping (don't even get me started on the terribleness of retailers starting to open their stores on Thanksgiving Day -- I refuse to encourage them by spending my money there! ), but somehow it's happened. Maybe it's because there is a not a lot of money to be made by retailers on the theme of Thanksgiving (unless you are a turkey farmer or a grocery store). I guess there is not a huge market for over the top decorations, turkey-themed tableware, etc and so retailers have written this day of thankfulness as a sentimental day of nothing-much. I object to that notion. When I reflect back to my childhood, I can feel the fullness of Fall and all the fun and promise there was as the newness of going back to school faded and nights turned cooler and we looked forward to dressing up and amassing candy on 10/31. After we gorged ourselves on treats, then we looked forward to a few weeks down the line when we would we have some days off from school and spend Thanksgiving with family (often traveling to be there). Then after all the brown and orange was officially put away, then the red and green would come out and we would set about preparing for Christmas and getting caught up in the pageantry and wonder. Now it seems all crammed together and a race to push through to the "ultimate prize" of Christmas Day -- all of which seems to produce a sense of loss and a feeling of a holiday hangover by New Year's Day. Do we even enjoy "the holidays" anymore? 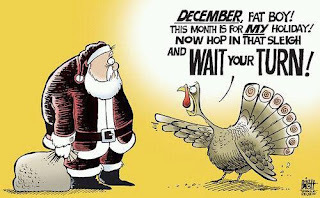 Or are we too busy rushing from each one (buying/making costumes, buying and making treats (or tricks), scrambling for a turkey and "all the trimmings" and shoving down the pumpkin pie so we can arrive at the "real holiday of Christmas." Like I said, I do love Christmas. I love the music (after Thanksgiving though! ), the food, the decor, the giving of gifts, peace and goodwill to man, thinking about the birth of Christ -- it's all wonderful! I guess what I don't enjoy is also what rankles me in every day life. I don't like to feel rushed or pushed through my days and through my life to the point where I feel like I am on some obstacle course and no longer enjoying the actual journey. And if we follow the retailers plan for their economic stimulus, then we end up feeling used, abused and yes...even grumpy. So, I am standing up and saying, "enough is enough!" 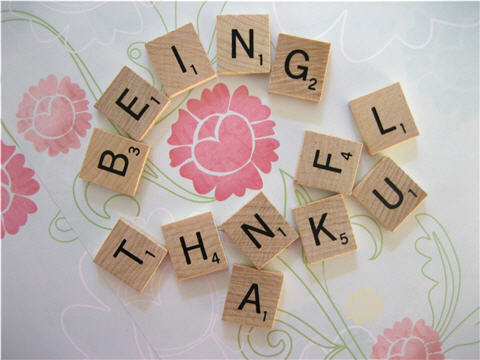 ...the business of being thankful. How on earth can we give gifts, goodwill, and holiday cheer unless we know why we do that? Out of a heart of gratitude. See the month of November is a time for me to reflect on all that I have been given (even and especially out of my perceived lack), to count and remember all of the people that I have been blessed to know and love, to be thankful for this body, this breath and this very life. Without gratitude and a thankful heart, we cannot cultivate the proper attitude to give...or receive. And, so I've drawn my own personal line in the sand. Christmas is not welcome here...not yet. Instead, I'm going to think of something each and every day that I'm grateful for and I'm going to ask my children to do the same. Before they gorge themselves in wrapped gifts and stocking stuffed with...stuff....I want them to count up their many blessings. And to that end, after I post this, I'm going to grab those jack-o-laterns that were spookily glowing just two nights ago, and hull them out, cut them up, roast them to yummy perfection and then make them into pumpkin puree....and then eventually pumpkin pie, or pumpkin muffins, or pumpkin bread. And then later around the dinner table, I'm going to embrace each and every one one of my four children and tell them how grateful I am that they were born and what they bring and mean to our family. Post Script: My children came home from school today and guess which movie they wanted to watch....Polar Express. How's that for irony?